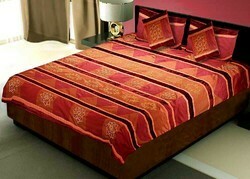 Our enterprise is considered as the noteworthy manufacturer, exporter and supplier of a broad gamut of Silk Bed Cover. By keeping in mind the defined industry norms, we design this product at our well-developed production unit utilizing the latest machines and advanced technology.Innovation is our forte and we are engaged in providing Silk Bed Cover to our customers. 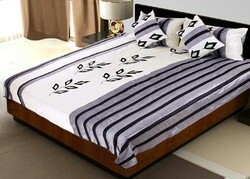 Best quality fabrics are used in the manufacturing process of these bed sheets to leave no scope for defects. 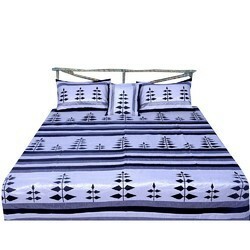 Also, catering to the bulk demands for these bed sheets, we have gained huge customer-base. In order to meet various requirements of clients, we offer product in various shapes, sizes and designs. 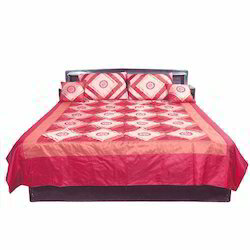 The 5 Piece Silk Double Bed Cover set contains one Double Bed Cover, two matching pillow covers, two matching cushion covers in traditional hand floral embroidery of Jaipur. 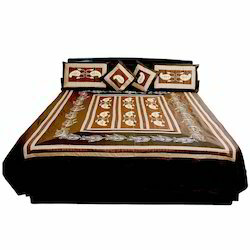 The product presents a good example of traditional craftsmanship of Rajasthan. 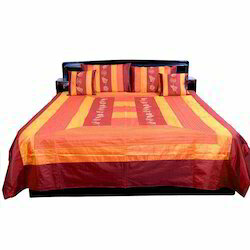 Decorate & brighten up your room space the way you like, with this fabulous Poly Dupion Silk Double bedcover set from the house of Little India. 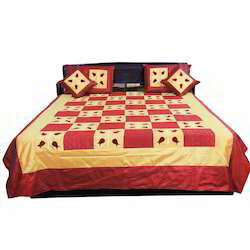 The set comprises a double bedsheet styled with an enthralling design and pattern, two cushion covers and two pillow covers that will flaunt your rich taste of decoration and luxury. 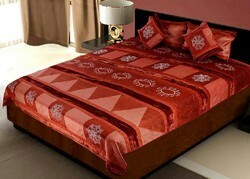 The classy style of this exclusive bedcover, pillow covers and cushion covers set makes it a price pick.